With increasingly regular protests and a violent crackdown by police and the military, the contested Indonesian region of West Papua is currently seeing the highest levels of agitation it has experienced in years. Against a backdrop of Indonesia’s forthcoming general elections in April, tensions are rising over long-standing human rights violations, pro-independence agitation and lack of accountability for crimes committed by security forces. On 1 December 2018, more than 500 people were arrested in cities across Indonesia for commemorating the 57th anniversary of Papuan attempts to declare independence from Dutch colonial rule. Raising the pro-independence Morning Star flag or publicly expressing support for Papuan self-determination is considered a criminal offense against the Indonesian state. The following day, on 2 December, pro-independence militants are reported to have killed up to 31 workers on the Trans Papua Highway construction project in the Nduga region of the Papuan highlands. Although the ongoing independence conflict in West Papua has resulted in the deaths of approximately 500,000 Papuans since 1969, this was the deadliest attack by militants in recent years. The government response has been fierce, with activists reporting that military action has forced thousands to flee their homes. With the media and civil society prevented from independently visiting the region, these reports are difficult to verify, but international human rights organisations have made pleas for calm. “We call on all parties, the Indonesian army, police and the Free Papua guerrilla fighters, not to target civilians,” says Andreas Harsono, Indonesia researcher for Human Rights Watch. West Papua, which forms about half of the island of New Guinea, was not part of Indonesia when it gained independence from the Netherlands in 1949. It was annexed in 1969 in a military-run election approved by the United Nations, in which about 1,000 hand-picked representatives were forced to vote against independence. West Papua was then ruled with the strongest of iron fists during Indonesia’s New Order era under General Suharto (1966-1998), before being granted special autonomy status in 2001 in a bid to quell the independence movement. The island’s population, estimated at around three million, are mostly Melanesian and follow either Christianity or indigenous religions, unlike the rest of Indonesia which is mostly Polynesian and Muslim. Natural resources have played a significant role in shaping the trajectory of Papuan history. Shortly after the rigged election of 1969, Freeport McMoRan, an American mining company, began operating in the region. This marked the beginning of a long relationship which has proved prosperous for the company and the Indonesian government. However, tax revenues mostly go to the western part of Indonesia which is much more developed; West Papua, in the east of the country, is the poorest region in Indonesia and its people see few benefits from resource extraction. In 2014, then Jakarta Governor Joko “Jokowi” Widodo (now president of Indonesia), an outside candidate in the presidential elections with no connection to Indonesia’s elite or military, made several campaign promises to address human rights in Papua. This included addressing the ability of the military to use its own internal trial mechanism rather than civilian courts, opening up the region to the foreign media and freeing political prisoners. Papuans saw hope in Jokowi, and he won the two provinces (Papua and West Papua, formerly Papua until 2003) that make up West Papua by more than 30 percentage points each. In an election where Jokowi won nationally by only 6.3 per cent, the region provided him with some of his best results. Even months after his inauguration, President Widodo reiterated his promises directly to Papuans after a police shooting in Paniai killed five people. “Jokowi made bold promises in front of Papuans attending Christmas celebrations, saying that he would investigate and solve this case, and bring peace to Papua,” says Papang Hidayat, a researcher at Amnesty Indonesia. Jokowi initially made a few attempts to improve the situation in West Papua by releasing five political prisoners in 2015 and declaring the region open to foreign journalists, for example. But his power has been limited due to the role of security forces in West Papua, including the Indonesian soldiers who have maintained their presence in the region despite the fall of Suharto’s military rule more than two decades ago. As a result, most of his promises to make reforms remain unfulfilled. One area in which Jokowi has been able to push forward is on development. The government is investing massively in roads, airports and agriculture, including a plan to build 1.2 million hectares of palm oil and sugar plantations. In the end, this has only increased tensions, as many Papuans feel that development is either aimed at extracting resources or benefitting migrant workers from other parts of Indonesia. That’s one reason why the December attack by separatists was against the construction of the centrepiece of this new development plan – the 4,300 kilometre Trans-Papua Highway. The response to the attack also highlights a major problem – that many in the Indonesian security apparatus do not distinguish between the peaceful protests and aspirations of the vast majority of Papuans, and a small minority of militants. In response to the Nduga attack, police arrested members of the West Papua National Committee (Komite Nasional Papua Barat, KNPB), a student-run organisation that coordinates peaceful protests, and forcefully closed their offices. With the security forces entrenched and Jokowi’s power limited, many fear that the divide between the two sides is growing. Papuans know that the April elections are unlikely to change anything. However, instead of waiting and hoping for action from Jakarta, more West Papuans are starting to agitate on local, national and global stages. In 2014, several West Papua independence organisations unified under the banner of the United Liberation Movement for West Papua (ULMWP), headed by the renowned Papuan activist Benny Wenda. The entity has been active within the 18-nation Pacific Islands Forum, founded in 1971, and the Melanesian Spearhead Group within it, which counts the four Melanesian nations of Fiji, Papua New Guinea, Solomon Islands and Vanuatu, as members. In 2017, organisers in West Papua undertook an impressive effort, smuggling a petition across the island and collecting signatures from 1.8 million residents – 70 per cent of the population – in support of an independence referendum, as promised in the 1960s. The petition was delivered to the United Nation’s Special Committee on Decolonization, to which Indonesia responded by arresting Yanto Awerkion, a KNPB activist and organiser of the petition drive, and sentencing him to 10 months in prison. One small opportunity to shine a light on the human rights abuses taking place in West Papua came when a UN human rights panel issued a statement condemning racism and police violence in the region, resulting in a rare apology from the Indonesian police for one incident in particular. There is also hope in the expression by the Indonesian foreign ministry that it will allow the United Nations High Commissioner for Human Rights to visit West Papua. However, civil society are skeptical that the UN visit, if it takes place, will result in concrete changes. Meanwhile the election campaign is gathering steam, with the Nduga incident becoming a campaign issue, spurring increased nationalist sentiment against West Papuans. Unfortunately, there may be little that either Jokowi or his opponent – former military general Prabowo Subianto, who has a checkered record due to his involvement in East Timor – can do to change the plight of Papua. The two countries signed the $1 billion pact in 2010, under the REDD+ (reducing emissions from deforestation and forest degradation) mechanism. In exchange for the funding, Indonesia would have to slow its emissions from deforestation, which accounts for the bulk of its CO2 emissions. Indonesia and Norway have agreed on a first payment from a $1 billion deal under which Indonesia preserves its rainforests to curb carbon dioxide emissions. The agreement comes nearly a decade since the deal was signed in 2010, with the delay attributed largely to the need for legislation and policy frameworks to be put in place, as well as a change in the Indonesian government since then. The amount of the first payment still needs to be negotiated by both sides, with Indonesia pushing for a higher valuation than the $5 per ton of carbon dioxide equivalent that Norway paid Brazil under a similar deal. Indonesia still has work to do to ensure a consistent pace of progress and tackle the forest fires that account for much of the loss of its forests. JAKARTA — It’s taken nearly a decade, but Indonesia is finally set to receive the first part of a $1 billion payment pledged by the Norwegian government for preserving some of the Southeast Asian country’s vast tropical rainforests. Human rights groups have called on the Papua Police to immediately and unconditionally drop the “rebellion” charge against three activists from the West Papua National Committee (KNPB) and release them. Amnesty International and Yayasan Pusaka issued a recent statement saying that the activists “were prisoners of conscience” who had not employed violence or hatred, and were imprisoned solely for expressing their political views in a peaceful manner. “The Indonesian authorities have used Article 106 of Indonesia’s Criminal Code, along with Article 110, to criminalize dozens of peaceful pro-independence political activists with the charge of rebellion in the last decade,” said Amnesty International Indonesia spokesman Haeril Halim. The incident began on Dec. 31, when the Indonesian Military (TNI) and regional police raided and seized the KNPB headquarters in Timika, Mimika Baru district. Security forces have since been using the organization’s offices as a TNI-police post. A few days prior to the takeover, the KNPB had sent a letter notifying the police that the organization would be holding a religious prayer and traditional Papuan feast to celebrate its anniversary. The police, who did not present a warrant for either arrest or search, came to the organization’s headquarters on the same day, arrested six activists and transported them to Timika Police Station. The police later released the activists without charge. Halim said that the organization’s legal representatives had sent a letter to the Mimika Police chief on Jan. 3, requesting that the security forces depart the KNPB offices and stop obstructing its members’ access to the building. On Jan 5, the Mimika Police summoned eight KNPB activists for questioning under suspicion of committing “acts of rebellion”. Three of the activists, Yanto Awerkion, Sem Asso and Edo Dogopia, were named as suspects and charged with rebellion on Jan. 8. “Article 106 of the Criminal Code enables authorities to sentence a person to life imprisonment or a maximum of twenty years for any attempts undertaken with the intent to bring state territory, wholly or in part, under foreign rule or as a separate part thereof,” Halim said. Feby Yoneska, an Indonesian Legal Aid Institute activist, shared his views, stressing that the organization’s recent activities should not have been deemed to be violating the law. “The article on rebellion can be applied only if it is proven that the activists prepared an attack with a subversive intention,” he told The Jakarta Post. He added that charging certain groups with rebellion was clearly a form of persecution. In the past decade, the West Papua National Committee has organized mass demonstrations in several Papuan cities to call for a referendum for self-determination. KNPB spokesperson Ones Suhuniap said it was unacceptable that someone could be charged with “rebellion” when they had merely voiced a different opinion. He said he believed that the charge was made only to justify the police’s seizure of the organization’s headquarters. “This shows the terrible state of law enforcement in Indonesia,” he said. The rights groups said that they took no stance on the political status of any Indonesian province, including calls for independence, and that the right to freedom of expression protected the right to peacefully advocate independence and other political solutions. Rebels in Indonesia’s troubled Papua province demanded Friday that the government hold negotiations on self-determination for the province and warned of more attacks. Sebby Sambom, spokesman for the West Papua National Liberation Army, the military wing of the Free Papua Movement, said in a telephone interview they attacked a government construction site last weekend because they believe the project is conducted by the military. Almost every December, the Indonesian region of Papua makes headlines both nationally and further afield. In 2018, following the arrest of hundreds of Papuans commemorating the region’s “independence day” on December 1, the nation was shocked by the killing of 31 construction workers allegedly by armed separatists – although the details are still unclear. There are now fears the violence could escalate. Ironically, these events took place as the Indonesian government makes a tremendous effort to develop Papua – which makes up the western half of the island of New Guinea and includes the Indonesian provinces of Papua and West Papua. In fact, no other Indonesian region outside Java receives so much attention, with the nation’s president, Joko “Jokowi” Widodo, visiting two or three times annually in recent years. But while his attention has been appreciated, Jokowi has also been accused of having a poor attitude to human rights abuses and state violence in the region. And while the president enjoys wide public support in Papua, the aspiration of Papuan self-determination is gaining traction both domestically and internationally. Since Papua was granted special autonomy (or “Otsus”) status by Indonesia in 2001, Jokowi’s prosperity-based approach has focused on developing infrastructure and improving connectivity. The government’s 4,330km Trans-Papua road project, for example, aims to put an end to the isolation of many Papuan communities. Jokowi also introduced the “BBM Satu Harga”, a national standard price for fuel. This policy aims to bring down the cost of fuel in Papua, which can reach Rp50,000-100,000 (£2.70-£5.40) per litre, nearly ten times the average price nationally. The pricing policy has proved popular, although in practice Papuans in the region’s highlands only enjoy the standard national price once or twice a month due to supply constraints. During Jokowi’s presidency, central government funding has also increased for both Papuan provinces. In 2016 alone, the central government allocated a 85.7 trillion rupiah (£4.6 billion) development fund for Papua and West Papua. On top of this Otsus fund, both provinces also have benefited from additional infrastructure spending. But while Papua has received a larger share of the country’s development fund than any other region, its public service provision is among the worst in the country. Major public health disasters are commonplace, such as the recent measles outbreak in Asmat Regency, which along with malnutrition killed hundreds of children. In fact, Papua has been at the bottom of the national human development index for decades. Jokowi has also focused on developing security, deploying thousands of additional soldiers to the region. Although aimed at strengthening national defence, there are ongoing concerns about human rights abuses in the region. A recent report by Amnesty International indicates that extrajudicial killings involving security personnel are still taking place in Papua. Jakarta is busy chasing away the smoke but not trying to put out the fire. Against this backdrop, the campaign for Papuan self-determination is growing. While there is some armed resistance, most Papuans campaign peacefully through democratic action such as mass rallies and social media campaigns. Domestically, this peaceful campaign is directed by the National Committee of West Papua (KNPB), the Papuan Student Alliance (AMP), and The Democratic People’s Movement of Papua (Garda Papua). These organisations are mostly supported by Papuan youths and students. But they have also been active beyond Papua, including in many of Indonesia’s biggest cities, such as Yogyakarta, Jakarta, Bandung and Surabaya on the island of Java, Denpasar on Bali, Medan on Sumatra, and Makassar and Manado on Sulawesi. Recently, the cause also received support from non-Papuan groups, such as the Jakarta-based Indonesian People’s Front for West Papua (FRI WP). Nor is this just a domestic issue. The United Liberation Movement for West Papua (ULMWP) was established in December 2014, two months after Jokowi took office, and has since been building support for the cause among Pacific nations. Vanuatu, the Solomon Islands and Tuvalu have raised the Papuan issue in UN forums many times. Which all goes to show that the Indonesian government’s strategy in the region has been less fruitful than expected. Jakarta’s trust-building project in Papua is falling short because of the government’s narrow perspective of the problem. Since the late 1990s, all Indonesian presidents except Gus Dur have tended to make the Papuan issueall about economic development. Other crucial issues stated in the “Otsus Law”, such as Papuan identity, local political parties, law enforcement, human rights and the protection of indigenous people, have been overlooked. Consequently, rather than facilitating the emergence of a strong and autonomous Papuan government, Otsus has made Papua even more dependent on Jakarta. And as the human rights issues remain unaddressed, the slogans of self-determination are being shouted even louder. Jakarta and Papua must now come together and reconsider the best options for a more constructive future relationship. For if the 17 years since the region was granted Otsus status have revealed anything, it’s that economic development alone is not enough to win the hearts and minds of the Papuan people. Disclaimer: The opinions expressed in this article are those of the author and do not reflect the official stance of The Jakarta Post. A GROUP called the “West Papua Interest Association” has been stopped from carrying out any awareness in the Kiunga-Tabubil area. PNG police confirmed a letter was received from the association, however due to the sensitivity of the issue they would be discussing and the type of awareness they are carrying out they were asked to not carry out their awareness. In the letter sighted by this newspaper, the team of 200 men and women would be arriving and coming in from Oksibil Star Mountain Regency of West Papua. From the 200 men and women, 50 were security forces with their identification such as a recognised ID cards and the sets of uniforms and another 150 men and women representing each district. The letter signed by Kare Kotanon Urupkulin, who is the international border coordinator, and stamped, is supported by Geoff Mecky Uropkulin, who is the team representative. The aim of the association is to carry out human rights violation awareness for one week in Kiunga. PNG’s border commander, Samson Kua said while he understood their rights to host an awareness of their continued efforts for freedom, he said it would not be appropriate to stage the awareness at a time the country was ready to deliver APEC in two weeks. He added that they did not want any disruptions experienced at the borders of the country. Mr Kua said the security of the country was imperative and important to maintain. “We have to also protect this country and ensure that the security of everyone in Western Province is protected. “I have already explained the reasons to the association and I hope they will adhere to what I have told them already,” Mr Kua said. “This country is hosting an important event in APEC, and I have stressed to the association that no awareness will be carried out. “I do not want any disruptions to the efforts of the Joint Security Taskforce along the borders. “Failure to adhere to the directives given will see the arrest of those who continue to disregard the directive that has been set,” Mr Kua said. “Let me assure the world that I can see the light at the end of the dark tunnel, that now the whole world knows more about West Papua than ever before so this is sure confidence for me which reflects the faith of the population of Vanuatu. “Indonesia can say whatever it wants to say but I am confident to say that West Papua is getting closer and closer and closer to its destiny for our Great God to give them their birthright and He is choosing us one by one to proclaim it to the world”. 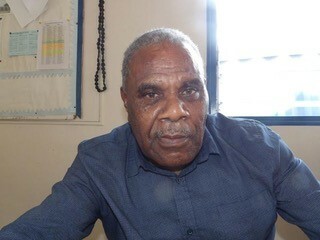 This is the first interview with the President of the Civil Society Organisations, Presbyterian Church Pastor Allan Nafuki, that support the longstanding struggle for freedom of the Melanesian people of West Papua. “My first message is that Vanuatu’s support for West Papua has not changed; chiefs, grandparents, fathers, mothers, young people and children’s support have not changed. Our mandate is to help West Papua to achieve self-determination and freedom”, he says. “It is the mandate of our Government to continue to lobby with other friendly countries to support the struggle of the people of West Papua to gain their freedom. “This is to secure enough support by other countries to help us to put the demand of West Papua before the Committee of 24. “We have so far 70 countries round the world that has aligned with Vanuatu to support our stand towards West Papua, and we need 30 more. “In the Pacific we have small countries including Tuvalu, Micronesia and Tonga even though our brothers of Fiji, PNG do not support us and Solomons are 50-50 and so we have seven or eight countries in the Pacific that support our stand plus some Caribbean and African countries”. Asked if the 70 countries are members of the UN, Pastor Nafuki says these are the countries that recognise and support the West Papua Issue. “We are lobbying for 30 more to arrive at the required 100 countries in order to push the West Papua issue to another level. “We thank God for our people including MPs Johnny Koanapo and Ralph Regenvanu and civil society organization of which I am Chairman. “With only 30 more countries to join the list, I am confident of a light at the end of the tunnel that by 2019, we will have enough numbers to push West Papua through the Committee of 24”, he says. “The Vanuatu Government is also committed to making sure that 100 countries will be supporting West Papua in the not too distant future”. Lobbying is now in progress with the 24 member countries of the Committee to support the West Papua Issue. “When Vanuatu raised the West Papua Issue at the UN, thousands of West Papuans marched in support of what Vanuatu was doing”, he said. An emergency meeting was held at the West Papua House at four o’clock yesterday afternoon in Port Vila for Vanuatu Free West Papua Association to be briefed on the latest situation on West Papua. Asked to comment on the Indonesian representative’s address at the UN, the Chairman said there was nothing new in it – only the same repetition since day one except Indonesia’s tightening of its security in the bush. However in the same way the West Papua Liberation Army has also tightened its security dividing the men and women and children into groups to move quickly. “For security reasons, only Indonesia’s side releases information while West Papua remains silent but we and United Liberation Movement of West Papua (ULMWP) know what is happening in West Papua”, he says. Our appeal to West Papuans is to remain vigilant to make sure that different factions within West Papua must always stand united to make sure that individual factions do not break the solidarity of the people of West Papua. “Let us all stand together to go forward in unity to achieve the goal through our prayers for God to continue to bless the people of West Papua. This is our faith and hope in Vanuatu for the people of West Papua”, he concludes. An Australian graduate student studying Indonesia and planning to visit Papua said she was devastated after being barred from entering the Southeast Asian country. Belinda Lopez, a PhD candidate at Macquarie University in Australia, wrote on her Twitter account that she had flown to Indonesia for a holiday but had been told by officials at Ngurah Rai airport in Bali that she was “blacklisted” by Indonesian immigration authorities. “I’ve been refused entry to Bali and have been held in a room at Denpasar airport on a couch since midnight. I am told I can only board a flight at 10 p.m. tonight, so that means I’ll be detained for nearly 24 hours before I’m deported,” she posted on Twitter on Saturday morning. Belinda, who has worked as a subeditor for The Jakarta Post and The Jakarta Globe and made podcasts for the ABC, said she did not know why she was denied entry. Other than visiting her friends, Belinda said she was also planning to attend the Baliem tourism festival in Papua. “Every country has the right to deny an individual entry to for various reasons. In Belinda’s case, it was only due to immigration matters,” he told The Jakarta Post over the phone on Saturday. He dismissed the notion that she had been denied entry because of her past profession as a journalist. Belinda said she had visited Papua two years ago and that the immigration office refused to renew her visa over suspicion she was also doing journalism. She had been told at the time that she could return to Indonesia six months later. By STEPHEN WRIGHT, Associated Press Aug. 4, 2018 Updated: Aug. 4, 2018 1:28 a.m.
JAKARTA, Indonesia (AP) — An Australian graduate student whose honeymoon plans in Indonesia included a cultural festival in the insecure Papua region says she’s being deported after officials accused her of being a journalist. Belinda Lopez told The Associated Press she was detained on arrival in Bali on Friday and has been informed she’ll be deported on a 10 p.m. flight Saturday. She said immigration officials wanted to know if she was a journalist and repeatedly asked her if she had “done something bad to Indonesia.”Almost a decade ago she was an editor for English-language newspapers in Jakarta, Indonesia’s capital, and has produced podcasts for Australia’s state broadcaster. A freelance journalism site says she won awards in 2012 and 2013 for reporting, including a report on juvenile incarceration in the U.S.
She is currently a Ph.D student at Sydney’s Macquarie University, studying the cultural experiences of migrants to Java, Indonesia’s most populous island. Being deported is “devastating,” Lopez said. “It’s the first place I moved to as an adult, have visited so many times since, to learn the language and to visit people who have become some of my best friends in the world,” she said in a WhatsApp message. Her holiday plans included the Baliem festival in the easternmost Papua region that Indonesia strictly polices and restricts foreign journalists and diplomats from visiting. A pro-independence insurgency has simmered in the Melanesian region since it was annexed by Indonesia in the early 1960s. Indonesia’s police and military are frequently accused of human rights abuses in Papua. A recent Amnesty International report documented 95 unlawful killings by security forces in Papua since 2008. Lopez said she was refused a visa renewal two years ago in Papua because officials suspected she was a journalist. At that time they said she couldn’t re-enter Indonesia for six months, according to Lopez. He said he couldn’t give other details because it’s a state secret. “We only carry out the duties as her name is listed on the government’s blacklist, so we have to refuse her entry,” said Aris.